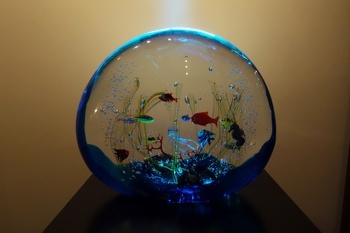 I had always been looking for a Murano aquarium, and when this became available, I couldn't resist. It was made Elio Raffaeli for Ogetti and is signed on the bottom - as he does for every single piece that he realizes. 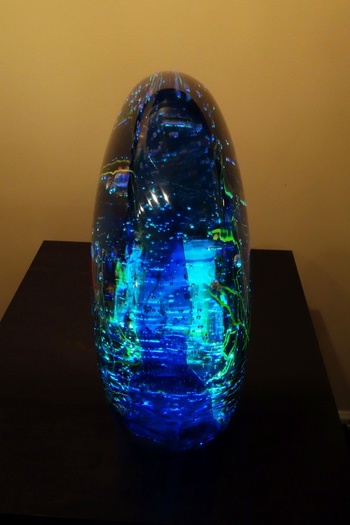 It's a massive piece of glass measuring 14" H x 16" W x 6" D and weighs 78 pounds! When I bought it, I didn't take the weight and shipping cost into consideration and was shocked at the quote. Fortunately, it was close enough for my wife Gloria and I to take the 7 hour trip up to Mass. to pick it up. The photos are taken on a lighted pedestal I purchased for the piece. As always, thanks for looking. Wow this is Beautiful! Really love it! Ah! This beats Murano hands down!!! I want one! LOL! It is Murano...shows what I know about glass!!! I've just never seen one quite like this before! Wow, You drove 7 hours to get it? Well, yeah, at 78 lbs I suppose I'd take that drive too. This must be so awesome in person. I love the way you have it set up and your photo is just perfect! Great job! Thanks so much for the kind comments Pops and Shareurpassiion, and thanks for the quick love Ron. Actually Shareurpassion, it is Murano... I overlooked including it in the title. Thanks for looking. Spectacular :) .....This has to be the most amazing piece of glass I've ever seen ! The skill required to create this is incredible ! Then to take a 7 hours drive to get it, plus purchase a special base for it....WE know you love it. Great Story!! It's breathtaking both in its beauty and weight. Like mikelv I marvel at how they did it.....particularly the bubbles! I am awed, impressed and enamored! Just beautiful and wonderful. Wow... This is so beautiful. Thank you so much for all of the kind comments, and thanks for the loves Aghcollect, PatSea, CindB, Arisellon and BennyBerg. It's so gratifying to be able to share my collection with you and receive such positive responses. Thanks again! Rick, you did it again!! Wow! 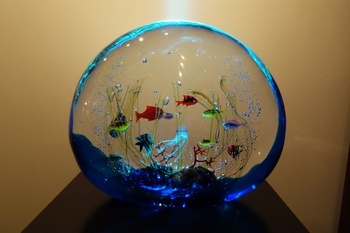 The colours, and the shape of the fish are so realistic, it looks like aquarium, added bonus you don't have to look after the fish. It's a beauty. Thank you for the comments Peasejean and Southcop and thanks for the loves Radgegunder, Vladamir, and Ho2cultcha. Believe it or not some of our friends actually thought it was an aquarium at first site. Rick, I can believe that, it's very realistic. Even more so in person. Unfortunately, the camera cannot capture the clarity and detail of the piece. Thank you. Thank you Vetraio and Peasejean. Every time I come across this, I think how marvellous it is, you have a good eye. Thank you so much for the kind comment Peasejean55. True striking piece! Love the blue glow and all the fishes and... tiny medusa! Thank you for the kind comment kyratango and thanks for the love Manikin. My thoughts exactly AR :). Great piece Rick and great choice with the lighted stand really makes it pop. Thank you so much Yesterdaysglass. When I first bought it -and before knowing how heavy it was- I intended to place it in a curio on a glass shelf. Obviously that would have been a disaster (for the shelf), so the stand came out of necessity and I couldn't think of a better way to display it. I agree with all of the above! Wonderful piece!! Thank you so much Nutsabotas6. Lol Inky. Actually, it sits right next to our T.V., so I can switch back and forth. Can I love this everytime it comes by??? LOL I was actually even thinking about it last night! I will forever want it! I'm with you on that shareurpassion, it's wonderful. Thank you so much for the kind comments Shareurpassion and Peasejean, and thanks for the love Rustfarm. Actually Shareurpassion there is currently one available on ebay (this size, but there is also a smaller one), but they're asking an ungodly amount. Wow, that's beautiful, and looks so real! Thank you upstatenycollector, your comment is appreciated. Wow, it's wonderful, I'll love again. This is so coooooooooool! !!!! Never seen one this good before ! Thanks so much for the comments and love Jean(again) and Surf, I appreciate it. There are certainly things in life that you can't forget, And this is one of them. Rick, sorry I'm loving this again. Still love this sooo much! Do you sit and stare at it??? I would! OMG -- I would have to ask SANTA for that!!! Even Santa would say Oh Gosh!! Thank you Share, I appreciate your loyalty LOL. I see what you mean about the pics. You'd think for the price they're asking they'd take GREAT pics... Oh well. Lovely piece of top-quality glass. 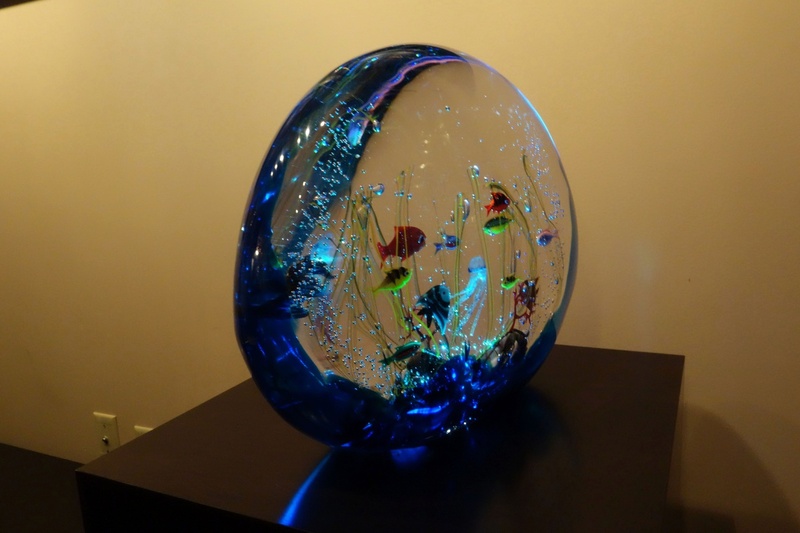 and such a pleasure to see something which shows the majority of far-east aquarium glass production, for what it is. Cheap, nasty, unskilled, mass-produced crap. I want one of these, or a Josef Rosinek Czech piece. Thank you so much for the positive comment verretcheque, it's definitely appreciated. I believe Shares size comment was her being facetious LOL. Thank you Nice, your enthusiastic comment is appreciated! Thank you so much Courtenay, it's definitely my favorite piece! OMG!!! I love Murano glass and especially the aquariums!! This is the most amazing piece I have seen yet. Congrats!!! I love it!!!! Thanks so much for the enthusiastic and flattering comment and love Lori! Also, thanks for the love Getthatmonkeyoutofme, it's appreciated!! @Lori... Welcome to CW! I look forward to seeing your posts! Wow, how pretty. I bet that took some time to accomplish. Thanks for the share. That little jellyfish is the coolest. OMG I am still drooling over the beauty of this!!! And you have acquired sooo many other beauties in your collection!!! Love them all! Shareurpassion, I'm the same, love, love, love Rick55. I just took a peek at some listed ones and NONE have the octopus in them...This one is the best and always will be. You've done such a beautiful job with the lights!!! Thanks so much for revisiting and great comments Jean and Share, it's so appreciated! Also, a late thanks for the love and comments that I missed earlier, it's very much appreciated! Thank you so much Buckhead, I appreciate it! I'm loving this again Rick. Stunning! I had to take out my measuring tape to understand just how big it is! I love the little octopus & the Neon Tetra looks neon! Amazing artistry. Thanks so much Celiene, Malkey and Celiene again. LOL. I'm glad you guys liked it, and I truly appreciate your excellent comments and love! Thank you Fran :-) What I've found is the larger the aquarium, the more goodies they were able to place inside of it. beautiful,i have about 6 pieces of murano glass,they do make beautiful pieces.i have never seen such a nice piece. Thank you so much Hedval, I appreciate the compliment coming from another Murano collector! I am on my way!!! And no, I am not joking besides the fact that someone I was very close to, taught me that there is a way to move anything, no matter how big, small or heavy an object may be...it can and now will be done! YeeHa!